I wrote this piece for a class in college, with a prompt from Christian Keathley's wonderful book, Cinephilia and History, or The Wind in the Trees, which asked participants to focus on a specific, seemingly meaningless moment to speculate on and draw from it larger, probably unintended meaning. To coincide with the recent release of Red River on Blu-ray, I thought it'd be a fitting time to revisit it. It has been modestly revised over the years. Red River is one of the greatest of all Westerns when it stays with its central story about an older man and a younger one, and the first cattle drive down the Chisholm Trail. 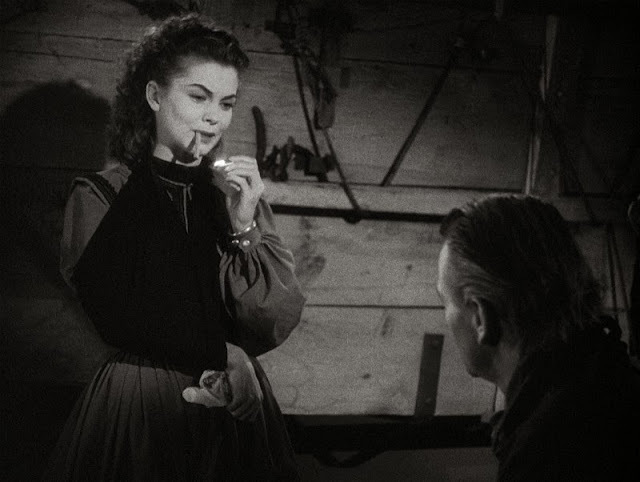 It is only in its few scenes involving women that it goes wrong…The three scenes with Tess (Joanne Dru) are the movie’s low points, in part because of her prattle (listen to how she chats distractingly with Matt during an Indian attack), in part because she is all too obviously the deus ex machina the plot needs to avoid an unhappy ending. Essentially, Ebert is right. Tess’ purpose is to make two people – Matthew Garth (Montgomery Clift) and Tom Dunson (John Wayne), suddenly get along after a bitter feud arose between them. I disagree, however, with Ebert’s assertion that Tess’ scenes are the low points. She provides the film’s most magical little moment. In her first conversation with Dunson, she swings her arm down and strikes a match on her table. It’s the swing of her arm and the instant ignition of the match that has me mesmerized. The swing itself suggests a casual nonchalance, and firmly establishes that she is in control of the scene; despite his cultural image, John Wayne appears quite small here, even weak. A lot is done with simple staging – she is standing and he is sitting – but it’s the match strike that instantly and naturally commands our attention. First, the means by which director Howard Hawks accomplished the shot is a minor miracle unto itself. He cuts quickly after the match is lit, but not right away – the shot lingers just long enough to show the match catch fire. The first thought that might roll through an audience member’s mind is that Tess had a strike anywhere match, a very common item today. However, this sequence takes place in 1866, but strike anywhere matches wouldn’t be developed until the early twentieth century. Matches have been around for centuries in one form or another, but it wasn’t until 1827 that they became anything close to what they resemble today; that is, based on friction, designed to ignite only when run against a specially prepared surface. Beyond that, the safety match wasn’t developed until 1844. Prior to this, matches shot sparks around and had pretty uncontrollable flames. Given that no sparks emitted and the flame was relatively under control, Tess was probably using a safety match. The striking surface required to ignite a match, however, was typically composed of 25% powdered glass, 50% red phosphorus, 5% neutralizer, 4% carbon black and 16% binder – probably not the rough makeup of Tess' table, which looks like it was coated with leather. Whatever it was covered with, it would be absurd for a table in a wagon train to be covered with a material that only really exists to strike matches on. So what happened? Does Tess have some cunning skill with a match? I propose instead that this sets Tess up as a force in the film. Roger Ebert noted that Tess is there basically as a plot device, and that’s true. But the film continuously tells us she has some sort of otherworldly quality. In her introduction, she’s receives an arrow to the shoulder and scarcely has a reaction; if it has any effect, her expression indicates it’s one of heightened sexual attraction. This, combined with her mastery of fire, tells us that Tess is more than just a person, but a force, which she proves to be when she somehow makes everything okay between Matt and Tom at the end. She’s capable of controlling the world around her. Besides, Tess is a “strike anywhere” girl. The strike-anywhere/safety dichotomy runs throughout Hawks’ work, and echoes into cinema today. This dichotomy typically comes in the form of two potential mates one of the protagonists must choose between. The clearest example comes in Bringing Up Baby - David (Cary Grant) is all set to marry the safest of all possible women, Miss Swallow (Virginia Walker), who wants nothing more than to support David in his work, even though that means denying him all of life’s pleasures. That is, until he meets one of the wackiest women in the history of film in Susan Vance (Katherine Hepburn), who grabs every chance life throws at her and lives every moment as though it were her last, a true “strike anywhere” woman if ever there were one. That’s not all, folks. Only Angels Have Wings shows a less immediately conflicted Cary Grant stuck between a woman who understands his love of flying, and one who wishes he’d just stay on the ground. His Girl Friday flips the gender roles, with Rosalind Russell torn between the very safe, secure Ralph Bellamy and the wild, unpredictable, fly-by-the-seat-of-his-pants Cary Grant. In The Big Sleep, Philip Marlowe seems to only run into “strike anywhere” types, from Vivian’s younger sister sleeping with every guy in town, to a bookstore employee who closes early to secure some private time with Bogart. Gentlemen Prefer Blondes takes this to the extreme, as we see Lorelei constantly pulled away from her obedient, soft-spoken fiancée towards a life of debauchery and extravagance, Dorothy somehow emerging as the stable one in the twosome, only looking for a man to truly love. Again and again, Hawks seems drawn to these dynamics, and regardless of where the script draws its ideological line (and it sometimes lands on “safe”), Hawks is always sure to posit the “strike anywhere” as by far the more interesting, more fulfilling possibility. Even when Cary Grant settles on the safe choice in Only Angels Have Wings, he does so as he rushes out the door, eager to get in the air again, and all the way up to that point, Jean Arthur, the “safe” one, is painted as too hysteric and anxiety-ridden to grasp what makes these men shoot up into the air. This strike-anywhere/safety dichotomy lives on today, albeit in the much less interesting Manic Pixie Dream Girl. Now a staple of all things quirky, one need only watch films such as Forgetting Sarah Marshall, Garden State, Elizabethtown, Superbad, Clerks II, or The Last Kiss to catch at least traces of girls who really have nothing else to do in their lives except be completely unpredictable and rescue the guy from his bland, boring life. What separates the modern trend from the one Hawks presented is that there is no second thought given to the modern “strike anywhere” girl. She is so obviously the right choice from the start, not just to the audience, but to the protagonist as well. In Hawks, Bringing Up Baby in particular, we see the natural, destructive end such behavior would no doubt bring about, not just to the protagonist’s personal life, but also to his or her job and everyone they come into contact with. Like Tess in Red River, Susan Vance seems to make the world around her conform to her whims, as David suddenly starts living the life Susan creates for him. This makes David’s decision all the more interesting and satisfying, as we know he’s attracted to her for her faults, not in spite of whatever faults she may one day reveal. And if that isn’t love, I don’t know what is. Apparently they had a type of strike-anywhere match at the time made from white phosphorus, which was toxic and killed and crippled workers in the match industry with a disease called "phossy jaw", leading to the eventual ban of white phosphorus matches.